So, I'm finally back after the busy summer period. I was working 6 or 7 days a week, and then I also had to read all of the Wheel of Time books from beginning to end because that is what you have to do when the final book comes out. So between the jobs and reading the 14 Wheel of time books in two months, I didn't craft much. But now I have a hat. 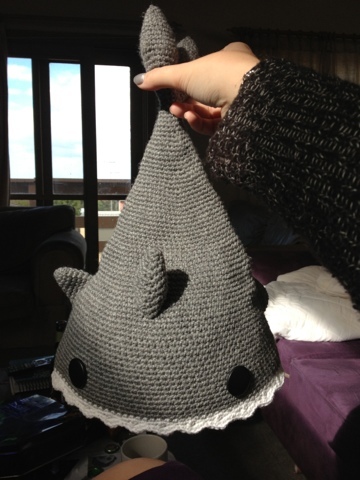 I made my boss a shark hat, because he loved the one I made for me. I'd love to say I could give people that pattern, but I can't because I totally made him up as I went along.